Here you will find a selection of press reviews on our New Art Up-Close book series, as well as details of exhibitions that our books have featured in. A solo exhibition of projects by the designers of the New Art Up-Close series, Graphic Thought Facility. Touring from the Design Museum in London. An exhibition of projects by the designers of the New Art Up-Close series, Graphic Thought Facility - "one of the hottest design companies in London". "Celebrating the most inspiring and innovative design projects in Europe over the past two years." "Who are the Chapman brothers anyway, and what's with the weird dummies? Those unfamiliar with the pair's intentionally stomach-turning aesthetic should start here. Small but perfectly formed, this series (former subjects are Gary Hume and Gavin Turk) squeezes more of an artist's career into 48 pages than you'd think possible, and a thorough list of further readings point the budding art aficionado in the right direction." "This neat new series of pocket-sized guides to artists' work are like tiny monographs, though without the weight, expense or drearily pretentious essays that usually entails. What you get instead is a kind of 'all you need to know', with an introduction, brief interview and a rundown of the artist's most important works with explanatory notes. "They may not be the coffee-table book you are looking for on your favourites, but they do provide an innovative and eloquent primer on artists whose work you may wish to explore further. This also makes them ideal for artists or art students seeking inspiration or affirmation. "The first two books cover the work of Gary Hume and Gavin Turk respectively, with interviews in question-and-answer format, based squarely around the process and reasons for creating certain pieces. The Turk edition works particularly well, with some of his more esoteric works nailed down context-wise, allowing you to take a fresh look at his waxworks and performances." Is that a handy book on contemporary art in your pocket? "Bringing contemporary art to a pocket near you, the New Art Up-Close series aims to provide handy, accessible introductions to the major players in modern art. Published by Royal Jelly Factory and designed by Graphic Thought Facility, each volume includes an in-depth interview with the artist, a biography, notes and 25 colour reproductions of their most famous works. The first two titles in the series, available now, cover Gary Hume and Gavin Turk. And, most importantly, their size makes them the perfect portable source of information for making you look knowledgeable and sophisticated in the pub." "In one respect the perfect book for the Christmas season is one that even if it is a stocking-filler can transcend this limitation. A perfect example of this would be the new series of miniature monographs by the British independent publisher Royal Jelly Factory. The first two books in the series, edited by Lucy Head and Art Monthly contributor David Barrett, are on Gavin Turk and Gary Hume and follow the same format of informative interview followed by well-chosen colour plates accompanied by extended captions, and are just the thing to open-up unsuspecting browsers - or stocking recipients - to contemporary art. It is certainly a series to look out for." "These are the first two in a new and brilliantly conceived series of pocket-sized books that aim to introduce 'the work of international, living artists ... to the growing audience for contemporary art'. "The books are mercifully free of jargon or any other form of pretentious 'art speak'. Each contains a brief biography which sets the artist and his work in context; this is followed by an extended interview giving the artists the chance to explain their work and why they do what; then follows a selection of colour illustrations spanning their career to date - with detailed explanations of each artwork; and finally a comprehensive page of 'Further Reading' with references to exhibition catalogues and art magazine reviews. "From all this we learn, for instance that Gary Hume trawls through images 'until I see a painting of mine', which he then projects onto a wall until he finds an image he is happy with. He almost always paints on the floor. When he thinks the picture is finished, he stands it up, which is always 'a disappointment, so I'll work out what to do, lay it down again and keep painting'. In 1991 he was elected a member of the Royal Academy of Arts, which says a lot about the professional respect in which he is held. "Gavin Turk is currently working on 'casting bits of chewing-gum in platinum'. He adds that 'I'm particularly keen on people sticking chewing-gum on posters. It's like a revenge for the visual pollution that marketing departments create'. The year 1991 was also important to him for in that year he presented for his graduation exhibition his empty white-washed studio at the Royal College of Art containing only a commemorative blue plaque. Uniquely, he was refused his degree. 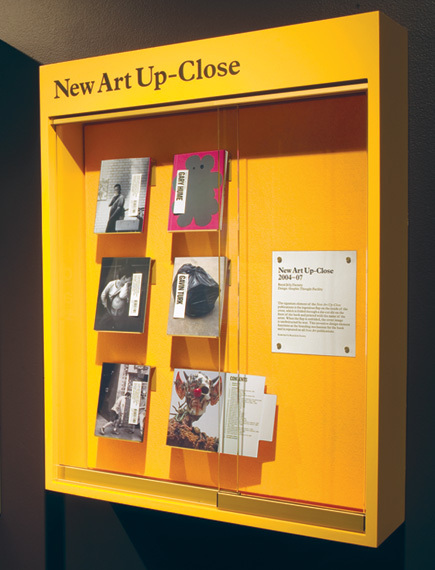 "The New Art Up-Close series are edited by Lucy Head and David Barrett, who contributes the texts. The books are inventively and attractively designed by Graphic Thought Facility. Warm congratulations and good wishes to all concerned with this most intelligent enterprise." "A cute and affordable new series of art books, produced with love and care, New Art Up-Close currently consists of two books, though there are plans to keep adding more. Start someone's collection with either the book on Gary Hume or the one on Gavin Turk, both eminent YBAs. Each book features a brief biography, a long interview with the artist, and a showcase of their work - all in a pocket-sized format." "There are also some nifty little gift books around, which make great stocking fillers and are available, in the time-honoured way, at all good bookshops. Two neatly pocket-sized, stylish art monographs on Gary Hume and Gavin Turk (Royal Jelly Factory; £4.99 each) offer accessible introductions to the work of these Brit Artists." "These dinky books are the perfect companions for any art or graphic design enthusiast. In these new editions in the New Art Up-Close series, Lucy Head and David Barrett focus on the careers of painter Gary Hume and sculptor Gavin Turk. Small enough to pop into the smallest stocking, minimal wrapping skills are required, while folded-tab covers guarantee hours of amusement. Perfect for when the turkey's all gone, but the drunken relatives have not." "Artists David Barrett and Lucy Head set up publishing company Royal Jelly Factory last year in order to publish and distribute a new series of artist profiles called New Art Up-Close. With GTF on board as designers, the first two books of the series have been produced, one on Gary Hume, the other on Gavin Turk. 'Our idea was to publish very user-friendly art books with as many colour images as possible for less than £5,' reveals Barrett. GTF came back with a clever, small format (just over A6) design incorporating a folded cover with a tab emerging from it which, explains GTF's Paul Neale, 'gives the books a character which is economic, provides branding and ties in with function.' The tabs on the front and back can be untucked, leaving the covers free of text. Printed by Hong Kong Graphics & Printing." "These are the first in a new series of small books about contemporary artists. They are quite nicely designed ladybird sized objects and cost £4.99, which is not a lot these days, the price of pork and duck rice in Chinatown, and a bit less than your average paper-back novel, still a fiver's a fiver and a stingy person might not wanna part with a real one to receive a book on art. "What's quite interesting is seeing the progression of the artist's work in such a concise way, you can flick through and see the beginning to now in 25 colour reproductions. There's an interview with the artist at the start which will tell you the usual overly taking themselves seriously stuff that artists speak when interviewed. In the back there's homework (further reading) and a useful explanation and contextual stuff for each of the plates (pictures of art). "Why did they choose Turk and Hume? Why not Richter and Freud? Or Hirst and Emin? Or some sexier couple. Anyway quibbling apart, I liked these books, there's more to them than you might think, and little books on art are a good thing. Full stop." "LONDON ... Meanwhile, another publishing house, Royal Jelly Factory - set up in 2003 by two artists, Lucy Head and David Barrett, to publish the new series 'New Art Up-Close', consisting of 48-page, colour-illustrated paperback monographs on contemporary artists - has produced its first two titles, Gary Hume and Gavin Turk. All the books are written by Mr Barrett and each includes an interview with the artist."